Cerebral sinus venous thrombosis (CSVT) is a disease that can be seen in all age groups with various clinical findings and usually a good prognosis. In this study, evaluation of the complaints on admission, the possible risk factors, localization, findings and treatment approaches, and discussion of these findings with comparison to the literature were aimed. The demographic, clinical, laboratory and the radiological characteristics of 19 patients with diagnosed with CSVT and followed at the Sakarya University Training and Research Hospital Clinic of Neurology. Nineteen patients (15 female, 4 male) with the diagnosis of CSVT were included. The mean age of the patients was determined as 31.3±11.2. Headache was determined to be the first symptom on admission in 17 patients. Nausea-vomiting (n=10), blurred vision (n=4) and epileptic seizures (n=3) had accompanied headache. Altered state of consciousness (n=2), papilledema (n=4), dysarthria (n=1), and cerebellar disorder (n=1) were determined. Two of the patients were pregnant and 6 patients were in the postpartum period. CSVT due to infection was determined in 2 patients. No reason for etiological investigation was found in 4 of the cases. In 11 patients, more than one etiology were detected. Two patients had been diagnosed with Behçet’s disease. MTHFR A1298C gene heterozygous mutation was most detected. Fourteen patients were determined to have a single sinus venous thrombosis and 5 patients had more than one sinus venous thrombosis on magnetic resonance venography. Six patients had venous infarction. Pregnancy and postpartum period are significant risk factors for CSVT. The association of more than one reason in the etiological investigations of patients despite the presence of one significant risk factor has been emphasized. Cerebral sinus venous thrombosis (CSVT) is a disease that can be seen in all age groups with various clinical findings and usually a good prognosis. It comprises around 0.5% of all causes of cerebrovascular stroke (1). Despite the disease being observed at all age groups, it is more commonly seen in adult females. The most important known etiologies are pregnancy and the postpartum period, oral contraceptives (OCPs), systemic inflammatory diseases, malignancy, infections, coagulation disorders and hematological diseases. The diagnosis and the awareness about the disease, which usually has a good prognosis, have increased because of advanced imaging techniques. The clinical and the radiological characteristics of 19 patients admitted to the Sakarya University Training and Research Hospital Clinic of Neurology and the Adult Emergency Service and treated in the neurology ward with the diagnosis of cerebral venous thrombosis (CVT) between 2011 and 2014 were evaluated in this study. The demographic, clinical, laboratory and the radiological findings of the patients were investigated. In this study, evaluation of the complaints on admission, the risk factors, localization of CSVT, findings and treatment approaches, and discussion of these findings with comparison to the literature were aimed. Vitamin B12, folic acid, thyroid stimulating hormone and the C-reactive protein levels of the patients, in addition to routine laboratory tests, were recorded. Homocysteine (HS), anti-nuclear antibody (ANA), anti-cardiolipin antibody (ACA), fibrinogen, active protein C resistance (APCR), anti-thrombin III (AT III), protein C (PC), protein S (PS), factor V Leiden (FVL) mutation, prothrombin gene G20210A mutation (Prt G2021A), methylene tetrahydrofolate reductase (MTHFR) C677T and A1298C gene mutations were analyzed in most of the cases where possible. The diagnosis of the disease was established according to the cranial magnetic resonance imaging (MRI) and cranial MRI venography, and the patients who were investigated with these imaging techniques were included for the evaluation. All procedures performed in studies involving human were in accordance with the ethical standards of Sakarya University Training and Research Hospital at which the studies were conducted (approval no: 71522473/050.01.04/66). Informed consent was obtained from the patients. A total number of 19 patients with the diagnosis of CSVT were included in the study. Table 1 presents the main characteristics of the patients. Fifteen of the patients were female and 4 were male. The mean age of the patients was determined as 31.3±11.2, while the mean age of the female patients was determined as 30.7±11.1. Headache was determined to be the complaint on admission in 17 (89.4%) patients. Ten of the cases that had presented with headache also had a history of nausea-vomiting, 4 had blurred vision and 3 had epileptic seizures. In addition, 1 patient had speech difficulty and 1 patient was admitted with the complaints of right-sided weakness, numbness and epileptic seizures. Altered state of consciousness was determined in 2 (10.5%) of the patients during the first examination. Furthermore, 4 (21.1%) patients had papilledema, 1 (5.3%) patient had dysarthria, and 1 (5.3%) patient had cerebellar disorder. Two (10.5%) of the patients were pregnant and 6 (31.6%) patients were in the postpartum period. None of the patients reported OCPs intake. Malignancy, immune suppression and thrombotic disease were not seen in the history of the patients. Infectious CVT was determined in 2 (10.5%) patients, one of which had mastoiditis and the other had dental abscess. Iron deficiency anemia was observed in 4 (21.1%) patients. No etiological reason underlying the condition was found in 4 (21.1%) of the cases. In 11 (57.9%) patients, more than one etiology were detected. Two (10.5%) patients had been diagnosed with Behçet’s disease as a result of the etiological investigation. Also 6 (31.6%) patients had a history of smoking. Three (25%) of 12 patients undergoing investigation for ANA tested positive, while all 12 patients undergoing investigations for ACA tested negative. In the genetic analysis, 1 (6.7%) of 15 patients evaluated for FVL gene mutation were heterozygous, 2 (13.3%) of 15 patients evaluated for Prt G20210A gene mutation were heterozygous, 2 (13.3%) of 15 patients evaluated for MTHFR C677T gene mutation were heterozygous and 2 (13.3%) of them were homozygous; 7 (46.7%) of 15 cases evaluated for MTHFR A1298C gene mutation were heterozygous and 1 (6.7%) of them was homozygous. Three (21.4%) of 14 patients undergoing HS level testing were determined to have high levels of HS. Two of the patients determined to have hyperhomocysteinemia, also had accompanying MTHFR A1298C gene mutation. Two (15.4%) of 13 patients checked for PC and PS levels had PC deficiency and 3 (23.1%) of them were determined to have PS deficiency. AT III levels were found to be within the normal range in all 13 patients undergoing evaluation. Hyperfibrinogenemia was determined in 1 (11.1%) out of 9 patients evaluated for fibrinogen levels. The heterozygous form was determined in 2 (20%) out of 10 patients evaluated for APCR levels. The diagnosis of the disease was established by cranial MRI and MRI venography. Fourteen (73.7%) patients were determined to have a single sinus venous thrombosis and 5 (26.3%) patients had more than one sinus venous thromboses. Venous infarction was determined in 6 (31.6%) of the patients (Figure 1a-d). CSVT has been reported to be more common among females. Similarly, it was determined to be more common among female patients at a rate of 78.9% in our study. The study reported that the male/female ratio was reported as 1:1.29 (2). The age distribution among males has a homogenous distribution. However, the 20-35 years age range is more common at a rate of 61% in female patients. This type of age distribution is thought to be caused by pregnancy and OCP intake (3). The mean age was determined as 32±11.13 in a study evaluating 51 patients (4). Similarly, the mean age was calculated as 31.3±11.2 years in our study, and the mean age of the female patients was determined as 30.7±11.1 years. Headache is the most common presenting symptom of CSVT. In one study, headache was observed at a rate of 65.5% and it was seen at a rate of 80% in another study (5,6). Similarly, the complaint on admission was headache in 89.4% of the cases in our study. Headache is usually accompanied by another symptom. In our study, headache was also accompanied by other neurological findings in 64.7% of the cases. Chronic daily headache without any other neurological deficit was determined in 10.6% of the cases in a study evaluating 47 patients (6). Nausea and vomiting due to increased intracranial pressure can be accompanying symptoms. Nausea and vomiting were present in 58.9% of the cases complaining of headache. Seizures, hemiparesis and altered state of consciousness can be observed in the symptomatology. Four of our patients had seizures and altered state of consciousness was present in 2 patients. Wide different causes are among the etiologies of CSVT. In our study 10.5% (n=2) of cases were pregnant and 31.6% (n=6) were in the postpartum period. Pregnancy is an important prothrombotic state. Coagulation proteins such as von Willebrand factor, factor VIII, factor V and fibrinogen are increased, PS is decreased and APCR develops during pregnancy (7,8). In a study, it was shown that venous thromboembolism (VTE) increased by 10-fold during pregnancy (9). In our study, one case was in the first trimester and the other case was diagnosed with CSVT in the last trimester. The risk of CSVT is the same for all trimesters during pregnancy; however, the frequency is increased during the postpartum period (10,11). The postpartum period was determined to be the most common cause with 33.3% of the patients in one study (4). Furthermore, a 3 to 8-fold increased risk in the postpartum period compared to the period before delivery has been determined in the literature (12). More than almost half of the CSVT cases developing in the postpartum period occur without any other triggering causes in the 3rd-4th days after delivery. Six patients in our study were in the postpartum period and it was observed that the cases were diagnosed on the 5th, 7th, 20th, 40th, 60th and the 180th days postpartum. CSVT can develop during the course of systemic infections. In a case series including 14 cases of CSVT, 4 patients were determined to have infection (13). CSVT occurs frequently during bacterial and fungal diseases; however, it can be observed during parasitic and viral diseases as well. The frequency of thrombosis due to infectious causes such as sinusitis, otitis media and mastoiditis is decreased as a result of common antibiotic administration. Untreated dental abscess and mastoiditis were determined in 2 of our cases (10.5%). These cases were evaluated as infection-caused CSVT. Iron deficiency anemia is a rare cause of CSVT in adults. Secondary thrombocytosis, hypercoagulability due to increased viscosity and increased metabolic stress caused by iron deficiency anemia are suggested hypotheses. In one study, the risk of developing CSVT was reported to be significantly higher in severe iron deficiency anemia patients compared to the control group (10). In our study, iron deficiency anemia was determined in 21.1% (n=4) of the cases. However, all these patients also either had pregnancy, were in the postpartum period, had infection or genetic mutations, and therefore, iron deficiency anemia-caused CSVT was not considered in any of these patients. FVL mutation is the most commonly seen genetic risk factor in VTE (3). The anticoagulation characteristic of APC is deteriorated by FVL, which is also called mutant factor, and the tendency towards thrombosis is increased (14). The FVL allele frequency in the general population is reported as 1-8%. The FVL gene mutation incidence was reported as 10% in a study including the Turkish population (15). Dentali et al. (16) reported FVL gene mutation as a risk factor contributing to the development of CSVT. Heterozygous FVL gene mutation increases the risk of thrombosis by 5-10 fold, while homozygous mutations increase this risk by 50-100 fold (14). In other studies, a significant relationship between FVL gene mutation and CVT was determined (17,18). In our study, FVL gene mutation was investigated in 15 patients and heterozygous mutation was determined in 1 case (6.7%). Prt G20210A mutation was shown to increase prothrombin levels in some studies, and to cause an increased risk of thrombosis by 2.7-3.8-fold and was reported as the second most common hereditary risk factor (14). The incidence of this mutation in patients diagnosed with CSVT has been reported as 11% and it is thought to cause a tendency towards thrombosis at higher rates than the FVL gene mutation alone (19). However, the estimated rate of this mutation for myocardial infarction, stroke or venous thrombosis was found as 1.05 in “The Physicians Health Study” evaluating 14916 cases prospectively (20). Heterozygous mutation was detected in 2 out of 15 patients (13.3%) investigated for Prt G20210A gene mutation. MTHFR gene polymorphisms (C677T, A1298C) presenting a risk factor alone or through HS levels is controversial. The incidence of these polymorphisms in healthy individuals has also been reported (21). In one study analyzing 376 cases, the prevalence of MTHFR A1298C mutation was reported to be higher than the prevalence of MTHFR C677T. They reported that 44.8% of the patients were normal, 42.3% were heterozygous mutant and 12.8% were homozygous mutant (21). According to the study conducted by Kluijtmans et al., (22) the MTHFR gene C677T variant shows a strong association with coronary artery diseases, peripheral artery diseases and venous thrombosis. The prevalence of homozygous mutant phenotype of MTHFR gene C677T variant has been reported as 5-9% in the Turkish population (23). In our study, 2 of 15 patients (13.3%) were determined to carry heterozygous and 2 were determined to carry (13.3%) homozygous MTHFR C677T mutation. 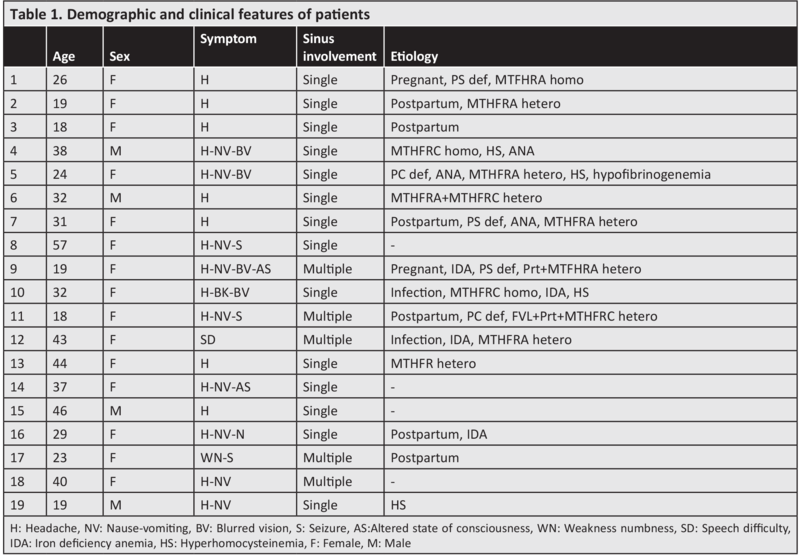 7 out of 15 (46.7%) patients investigated for MTHFR A1298C mutation were determined to have heterozygous and 1 of them to have a homozygous mutation. These mutations are clinically relevant if they cause hyperhomocysteinemia (24). In our study, associated homozygous MTHFR A1298C gene mutation was determined in 2 patients. PC, PS and AT III deficiency are known causes of VTE; however, its importance in CSVT is not certain (19). In our study, 2 (15.5%) patients were determined to have PC deficiency, and 3 (23.1%) patients to have PS deficiency, while all patients were found to have normal AT III levels among the 15 patients who were investigated for PC, PS, AT III levels. Reasons such as pregnancy, postpartum period and genetic mutations were present in PC- and PS-deficient patients. Association of more than one risk factor is important in the etiological investigations for CVT patients. Systemic investigation of each risk factor is important even in patients with one significant risk factor. Presence of more than one risk factor has been emphasized to increase the thrombosis risk significantly (25). In our study, the rate of patients with more than one etiology was determined as 57.9% (n=11). In International Study CVT (Study on Cerebral Vein and Dural Sinus Thrombosis), 44% of the cases were reported to have more than one reason, and 22% had hereditary thrombotic factors (26). Besides the variety in the etiology, no reason could be determined in 15% of the patients. No reason that could lead to CSVT was determined in 4 of our cases. ANA-positivity was determined in 3 patients as a result of vasculitis investigation and 1 of them was diagnosed with Behçet’s disease at the end of 2-year follow-up. Another patient was diagnosed with Behçet’s disease after the diagnosis of CSVT. CSVT is one of common neurological complications of Behçet’s disease (25). MRI and MRI venography are the first choice of investigation for the diagnosis of CSVT. All patients in our study were diagnosed with MRI and MRI venography. Six (31.6%) of our patients were determined to have venous infarction. The most frequently affected sinuses are the superior sagittal, transverse, sigmoid, cavernous and the sinus rectus, respectively. In a case series reported by Azin and Ashjazadeh (27) including 61 cases of CSVT, in 80.3% of the cases, the thrombosis was detected in the superior sagittal sinus; the sigmoid sinus was affected in 6.5% and cavernous sinus thrombosis was detected in 4.9%. However, transverse sinus involvement was the most common in our study with 15 patients. Other more common localizations are found in the literature. In another study, sigmoid sinus involvement was observed in 74.5% of 47 patients (6). Transverse sinus involvement was determined in another study including 13 CSVT cases (28). Involvement of more than one sinus was observed in 65.5% of the cases in one study and 31.1% was observed in another study (5,13). A rate of around 30% is observed for more than one sinus involvement. Anticoagulant therapy is the first choice (29,30). Recently developed new oral anticoagulant medications are being investigated for new options for treatment of CSVT (31). Very good improvement was observed in 87% of 15 patients receiving dabigatran and followed with detection of 80% recanalization (32). However, studies have been conducted with small numbers of patients and wider studies are required for higher efficiency (32,33). Anticoagulant treatment is our first choice despite the risk of increased hemorrhage, and 2 pregnant and 4 postpartum patients were treated with low molecular weight heparin and followed-up. CSVT has high morbidity and mortality if not diagnosed and treated early. 6-10% of the cases develop mortality despite adequate treatment (34). It was found that altered state of consciousness, hemorrhagic infarct, acute onset and hemiparesis were associated with an increased rate of mortality in a study including 47 CSVT patients (6). We did not have any cases resulting with mortality in our study. In present study. Our study also had a limitation about number of patients. Future prospective studies in large numbers of patients are needed to better describe features of CSVT patients. Ethical Committee Approval: All procedures performed in studies involving human were in accordance with the ethical standards of Sakarya University Training and Research Hospital at which the studies were conducted (approval no: 71522473/050.01.04/66). Surgical and Medical Practices: Z.Ö.A., R.Ö.Ö., A.B., Concept: Z.Ö.A.,R.Ö.Ö., A.B., Design: Z.Ö.A., R.Ö.Ö., A.B., Data Collection or Processing: Z.Ö.A., R.Ö.Ö., A.B., Analysis or Interpretation: Z.Ö.A., R.Ö.Ö., A.B., Literature Search: Z.Ö.A., R.Ö.Ö., A.B., Writing: Z.Ö.A., R.Ö.Ö., A.B. Leys D, Cordonnier C. Cerebral venous thrombosis: Update on clinical manifestations, diagnosis and management. Ann Indian Acad Neurol 2008; 11: 79-87. Ferro JM, Lopes MG, Rosas MJ, Ferro MA, Fontes J; Cerebral Venous Thrombosis Portugese Collaborative Study Group. Long-Term Prognosis of Cerebral Vein and Dural Sinus Thrombosis: Results of the Venoport Study. Cerebrovasc Dis 2002; 13: 272-8. Tıraş R, Hakyemez HA, Öztürk O, Meral H, Çetin S, Yayla V, et al. Cerebral venous sinüs thrombosis: retrospective study with 14 patients. Turkish Journal of Cerebrovascular Disease 2007; 13: 251-4. Karadas S, Milanlioglu A, Gönüllü H, Sayin R, Aydin MN. Cerebral venous sinüs thrombosis presentation in emergency department in Van Turkey. J Pak Med Assoc 2014; 64: 370-4. Kocatürk O, Coşkun O, Ocal R, Inan L, Ozkan S. Retrospective analysis of factors, etiological factors and treatment options in patients with cerebral venous thrombosis. Meandros Med and Den Journal 2012; 13: 13-8. Uzar E, Ekici F, Acar A, Yücel Y, Bakır S, Tekbaş G, et al. Cerebral venous sinus thrombosis: an analyses of 47 patients. Eur Rev Med Pharmacol Sci 2012; 16: 1499-505. Agostoni E, Aliprandi A, Longoni M. Cerebral venous thrombosis. Expert Rev Neurother 2009; 9: 553-64. Martinelli I, De Stefano V, Taioli E, Paciaroni K, Rossi E, Mannucci PM. Inherited thrombophilia and first venous thromboembolism during pregnancy and puerperium. Thromb Haemost 2002; 87: 791-5. Mc Coll MD, Walker ID, Greer IA. The role of inherited thrombophilia in venous thromboembolism associated with pregnancy. Br J Obstet Gynaecol 1999; 106: 756-66. Stolz E, Valdueza JM, Grebe M, Schlachetzki F, Schmitt E, Madlener K, et al. Anemia as a risk factor for cerebral venous thrombosis? An old hypothesis revisited. Results of a prospective study. J Neurol 2007; 254: 729-34. Huisman MV, Rosendaal F. Thrombophilia. Curr Opin Hematol 1999; 6: 291-7. McColl MD, Ramsay JE, Tait RC, Walker ID, McCall F, Conkie JA, et al. Risk factors for pregnancy associated venous thromboembolism. Thromb Haemost 1997; 78: 1183-8. Şenol MH, Toğrol E, Kaşıkçı T, Tekeli H, Ozdağ F, Saraçoğlu M. Cerebral venous thrombosis: Analyses of sixteen cases. Düzce Med J 2009; 11: 32-7. Friedline JA, Ahmad E, Garcia D, Blue D, Ceniza N, Mattson JC, et al. Combined factor V leiden and prothrombin genotyping in patients presenting with thromboembolic episodes. Arch Path ol Lab Med 2001; 125: 105-11. Akar N, Akar E, Dalgin G, Sözüöz A, Omürlü K, Cin S. Frequency of Factor V (1691G~A) mutation in Turkish population. J Thromb Haemost 1997; 78: 1527-9. Dentali F, Crowther M, Ageno W. Thrombophilic abnormalities, oral contraceptives, and risk of cerebral vein thrombosis: A meta-analysis. Blood 2006; 107: 2766-73. Pai N, Ghosh K, Shetty S. Hereditary thrombophilia in cerebral venous thrombosis: a study from India. Blood Coagul Fibrinolysis 2013; 24: 540-3. Ben Salem-Berrabah O, Fekih-Mrissa N, N'siri B, Ben Hamida A, Benammar-Elgaaied A, Gritli N, et al. Thrombophilic polymorphisms - factor V Leiden G1691A, prothrombin G20210A and MTHFR C677T - in Tunisian patients with cerebral venous thrombosis. J Clin Neurosci 2012; 19: 1326-7. Wysokinska EM, Wysokinski WE, Brown RD, Karnicki K, Gosk-Beirska I, Grill D, et al. Thrombophilia differences in cerebral venous sinus and lower extremity deep venous thrombosis. Neurology 2008; 70: 627-33. Ridker PM, Hennekens CH, Miletich JP. G20210A mutation in prothrombin gene and risk of myocardial infarction, stroke and venous thrombosis in a large cohort of US men. Circulation 1999; 99: 999-1004. Li Z, Sun Li, Zhang H, Liao Y, Wang D, Zhao B, et al. Elevated plasma homocysteine was associated with hemorrhagic and ischemic stroke, but Methylenetetrahydrofolat Reductase gene C677T polymorphism was a risk factor thrombotic stroke: a multicenter case-control study in China. Stroke 2003; 34: 2085-90. Kluijtmans LA, van den Heuvel LP, Boers GH, Frosst P, Stevens EM, van Oost BA, et al. Molecular genetic analysis in mild hyperhomocysteinemia: a common mutation in the methylenetetrahydrofolate reductase gene is a genetic risk factor for cardiovascular disease. Am J Hum Genet 1996; 58: 35-41. Sazci A, Ergul E, Kaya G, Kara I. Genotype and allele frequencies of the polymorphic Methylenetetrahydrofolate Reductase gene in Turkey. Cell Biochem Funct 2003; 23: 51-4. McBane RD 2nd, Tafur A, Wysokinski WE. Acquired and congenital risk factors associated with cerebral venous sinus thrombosis. Thromb Res 2010; 126: 81-7. Afsar N, Aktan S. Sererbral Venöz Tromboz In: Balkan S, editor. Serebrovasküler Hastalıklar. 3rd ed. Ankara: Güneş kitabevi; 2009: 135-46. Ferro JM, Canhao P, Stam J, Bousser MG, Barinagarrementeria F; ISCVT investigators. Prognosis of Cerebral Vein and Dural Sinus Thrombosis: Results of the International Study on Cerebral Vein and Dural Sinus Thrombosis (ISCVT). Stroke 2004; 35: 664-70. Azin H, Ashjazadeh N. Cerebral venous sinüs thrombosis-clinical features, prediposing and prognostic factors. Acta Neurol Taiwan 2008; 17: 82-8. Çoban E, Gökyiğit FM. Clinic and aetiology cases with cerebral venous thrombosis; survey of 13 cases. Turkish Journal of Cerebrovascular Disease 2012; 18: 16-9. Einhaupl KM, Villringer A, Meister W, Mehraein S, Garner C, Pellkofer M, et al. Heparin treatment in sinus venous thrombosis. Lancet 1991; 338: 597-600.
de Bruijn SF, Stam J. Randomized, Placebo-Controlled Trial of Anticoagulant Treatment With Low Molecular-Weight Heparin for Cerebral Sinus Thrombosis. Stroke 1999; 30: 484-8. İnce B. New oral anticoagulant drugs fort he treatment of cerebral venous sinüs thrombosis. Turkish Journal of Cerebrovascular Disease 2016; 22: 49-51. Mendonça MD, Barbosa R, Cruz-e-Silva V, Calado S, Viana-Baptista M. Oral direct thrombin inhibitör as an alternative in the management of cerebral venous thrombosis: a series of 15 patients. Int J Stroke.2015; 10: 1115-8. Geisbüch C, Richter D, Herweh C, Ringleb PA, Nagel S. Novel factor Xa inhibitör fort he treatment of cerebral venous and sinüs thrombosis. First experience in 7 patients. Stroke 2014; 45: 2469-71. Öztürk V. Cerebral Sinüs Thrombosis. Neurol Sci Neurophysiol 2007; 10: 5-6.